Tennis Elbow vs. Golf Elbow: What’s the Difference? Home/News/Tennis Elbow vs. Golf Elbow: What’s the Difference? What is tennis elbow? What is golf elbow? The scientific term for tennis elbow is lateral epicondylitis. This injury affects the tendons attached to the outer (lateral) side of the elbow, which are connected to the muscles that extend your wrist backwards and straighten your fingers. Tennis elbow is an overuse and muscle strain injury that results in pain and inflammation of the outside of the elbow and forearm areas. The scientific term for golf elbow is medial epicondylitis. This injury affects the tendons connected to the inner (medial) side of your elbow which are attached to the muscles that flex your wrist and contract your fingers when you try to grip something. Golf elbow is also a overuse and muscle strain injury but, unlike tennis elbow, pain and inflammation from golf elbow is present in the inner elbow and forearm. Symptoms for both of these injuries usually start gradually and worsen over time. Both of these conditions are a type of tendonitis, or inflammation of the tendon, and both are caused by overuse of the tendon. This may be due to excessive force on a regular basis (like hitting a tennis or golf ball; hence the name of both injuries) or due to other repetitive activities that involve the forearm muscles. If left untreated, tendons can progress from inflammation, to partial thickness tears or, in extreme cases, full thickness tears. 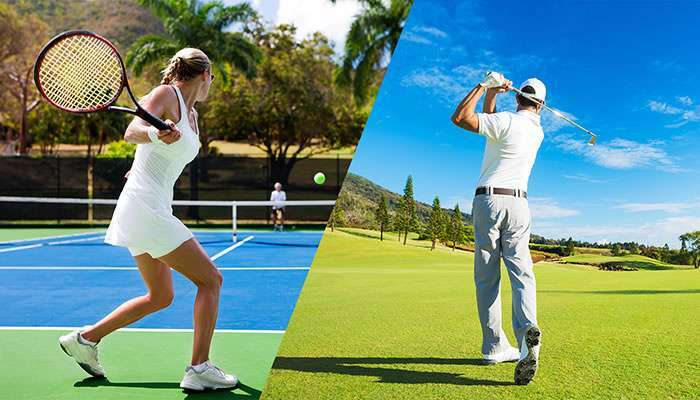 While tennis elbow and golf elbow are similar in the type of injury, they differ in the area of the arm that is damaged and the tendon that needs to be treated. Mistaking one for the other may cause you to treat the incorrect tendon leading the actual injured tendon to become more severely damaged. Have you been struggling with tendonitis for a while and are wondering what to do about it? Get a FREE personalized assessment and treatment kit recommendations from our injury specialists!